According to PVMBG a three-minute-long phreatic eruption at Dempo began at 1651 on 9 November, and generated a dense ash plume that rose 4.2 km (13,800 ft) a.s.l., about 1 km above the crater rim, and drifted S. The Alert Level remained at 2 (on a scale of 1-4). Activity at Dempo on Sumatra in recent years has consisted of brief phreatic eruptions, most recently single-day events on 25 September 2006 (BGVN 34:03) and 1 January 2009 (BGVN 34:01). There were no additional reports from the Center of Volcanology and Geological Hazard Mitigation (CVGHM), also known as Pusat Vulkanologi dan Mitigasi Bencana Geologi (PVMBG), until a brief episode of unrest in late April 2015, Another typically short phreatic explosion took place on 9 November 2017. Activity during 2015. On 29 April the Alert Level was raised to 2 (on a scale of 1-4) by PVMBG following observations of diffuse white-gray plumes on 27 April rising to 50 m above the crater. Seismicity had increased during April compared to the previous month (figure 5). 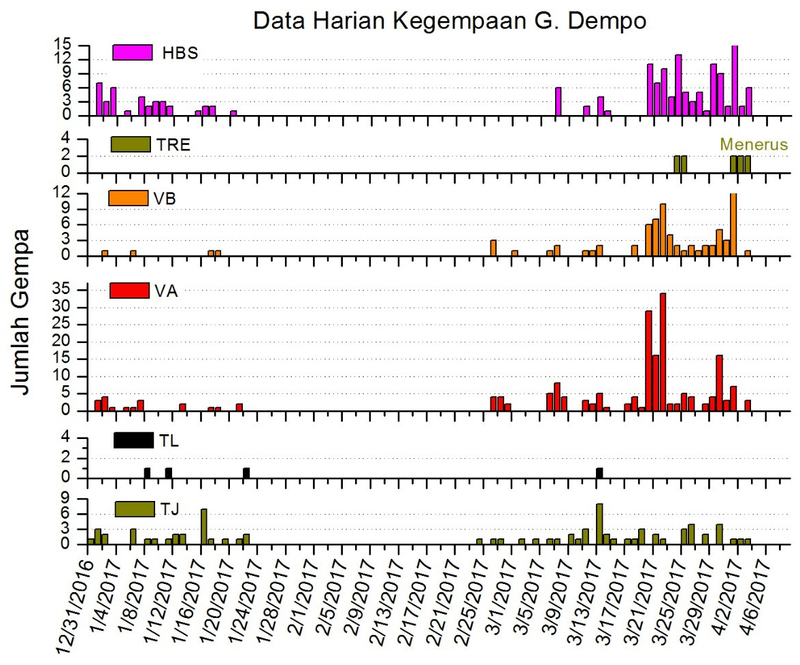 A Detik news report on 30 April quoted the PVMBG Head of the Western Volcano Field of Observation and Investigation, Hendra Gunawan, as saying that there had been tremor recorded over the previous four days. No ashfall was reported by PVMBG, and a phreatic eruption was only mentioned in the 29 April notice as a potential danger. Figure 5. Seismicity recorded at Dempo from 1 January to 29 April 2015. The types of earthquakes reported are HBS (Hembusan, puff or emission events), Trm (tremor), VB (shallow volcanic type B), VA (volcanic type A), TL (local tectonic), and TJ (distant tectonic). Courtesy of PVMBG. Observers reported that during 1 June-9 September 2015 no plumes were seen and seismicity was low. On 10 September PVMBG lowered the Alert Level to 1. Activity during 2017. Staff at the PVMBG Dempo observation post reported that no plumes rose from the crater during January and February 2017, but some diffuse white plumes during 1 March-4 April rose no higher than 50 m. Seismicity increased significantly above background levels from 21 March to 4 April (figure 5). On 5 April PVMBG raised the Alert Level to 2 based on visual and seismic data, but did not report any phreatic eruptions. Figure 6. Seismicity recorded at Dempo from 31 December 2016 to 6 April 2017. The types of earthquakes reported are HBS (Hembusan, puff or emission events), TRE (tremor), VB (shallow volcanic type B), VA (volcanic type A), TL (local tectonic), and TJ (distant tectonic). Courtesy of PVMBG. According to PVMBG a three-minute-long phreatic eruption began at 1651 on 9 November 2017 and generated a dense ash plume that rose to 4.2 km altitude, about 1 km above the crater rim, and drifted S. Ashfall and sulfur gases were reported in villages on the S flanks, but there was no damage to property or injuries. The Alert Level remained at 2, with a 3-km-diameter exclusion zone; the Aviation Color Code was at Yellow. Information Contacts: Pusat Vulkanologi dan Mitigasi Bencana Geologi (PVMBG, also known as Indonesian Center for Volcanology and Geological Hazard Mitigation, CVGHM), Jalan Diponegoro 57, Bandung 40122, Indonesia (URL: http://www.vsi.esdm.go.id/); Detiknews (URL: https://news.detik.com/). Observers at the PVMBG Dempo observation post reported that during January and February no plumes rose from Dempo's crater, and during 1 March-4 April diffuse white plumes rose no higher than 50 m above the crater. Seismicity increased from 21 March to 4 April. The Alert Level was raised to 2 (on a scale from 1-4) on 5 April. Visitors and residents were advised not to approach the craters within 3 km. Observers at the PVMBG Dempo observation post reported that during 1 June-9 September no plumes rose from Dempo's crater and seismicity was low. On 10 September the Alert Level was lowered to 1 (on a scale from 1-4). Visitors and residents were advised not to approach the craters. Observers at the PVMBG Dempo observation post reported that during 0730-0900 on 27 April diffuse gray-white plumes rose 50 m above Dempo crater. Seismicity had increased during April as compared to the previous month. On 29 April the Alert Level was raised to 2 (on a scale from 1-4). Visitors and residents were advised not to go within a 1-km radius of the summit. On 23 March, CVGHM lowered the Alert Level for Dempo from 2 to 1 (on a scale of 1-4) based on visual observations of the crater lake during 5-6 January and 2-4 March, and decreased seismicity since a phreatic eruption on 1 January. Visitors and residents were advised not to go within a 1-km radius of the summit. CVGHM reported that on 1 January, a phreatic eruption from Dempo resulted in a strong sulfur odor and "ash rain" that was noted as far as about 10 km from the summit. Fog prevented direct observations of the summit. The Alert Level was raised to 2 (on a scale from 1-4). Visitors and residents were advised not to go within a 2-km radius of the summit. At 1810 on 18 September an earthquake was felt in an area around Dempo. The Volcanological Survey of Indonesia (VSI) reported its Modified Mercalli (MM) Intensity as MM IV. The following day three more earthquakes were felt: the first event took place at 0900 (MM II), the next at 1155 (MM I), and the last at 1800 (MM I). Recorded seismicity during these days indicated 30 events/day with amplitudes of 20-30 mm and arrival time differences (S-P) of 2-3 seconds on average. Volcanologists took this to mean that the earthquakes were local tectonic events. No visible signs of changed activity were apparent at the crater. The VSI took the precaution of increasing the condition of alert to Level II. According to a report by Indonesia's Center of Volcanology and Geological Hazard Mitigation (CVGHM), Dempo had a phreatic eruption on 1 January 2009. The event resulted in a strong sulfur odor and an ash (or cinder) rain that was noted as far as ~ 10 km from the summit. During 27 December 2008 to 1 January 2009, fog prevented direct observations of the summit; clouds over the summit area are a common occurrence. The one available photo of the eruption showed a whitish-colored plume rising perhaps a few kilometers over the summit. On 1 January authorities raised the alert status from 1 (normal) to 2 (alert, "Waspada" in Indonesian), on a scale that ranges from 1-4. Visitors and residents were advised not to go within a 2-km radius of the summit. A 2 January report from CVGHM noted that both local volcanic and regional tectonic earthquakes were recorded during 27 December 2008 through 1 January 2009 (table 1). Table 1. Highlights of Dempo seismicity recorded during 27 December 2008 to 1 January 2009. Courtesy of CVGHM. 27 Dec 2008 One local volcanic (A-type), and two tectonic. 28 Dec 2008 One local volcanic (A-type), and one air blast event. 29 Dec 2008 One local volcanic, five air blasts, and two tectonic. 30 Dec 2008 One shallow local volcanic, one air blast, one low-frequency, and one tectonic. 31 Dec 2008 One local volcanic, one air blast, and two tectonic not at the volcano. 01 Jan 2009 One local volcanic related to the explosive eruption. As of early 2009, no thermal anomalies had been measured over Dempo by the MODVOLC infrared satellite system for at least the last 5 years. ASTER images from 2001-2007 show extensive cloud cover. Information Contacts: Center of Volcanology and Geological Hazard Mitigation (CVGHM), Jalan Diponegoro 57, Bandung 40122, Indonesia (URL: http://vsi.esdm.go.id/); Hawai'i Institute of Geophysics and Planetology (HIGP) Thermal Alerts System, School of Ocean and Earth Science and Technology (SOEST), Univ. of Hawai'i, 2525 Correa Road, Honolulu, HI 96822, USA (URL: http://modis.higp.hawaii.edu/). Our most recent report on Dempo (BGVN 34:01) discussed a phreatic eruption on 1 January 2009. This eruption prompted Indonesia's Center of Volcanology and Geological Hazard Mitigation (CVGHM) to raise the alert level from 1 (normal) to 2 (alert) on a scale of 1-4. A few months later, on 23 March 2009, the CVGHM lowered Dempo's Alert Level to 1, based on visual observations of the crater lake during 5-6 January and 2-4 March, and decreased seismicity since the 1 January phreatic eruption. The name Dempo applies to both the larger complex and to a peak that sits adjacent to a neighboring peak called Marapi. The latter volcano name applies to several different volcanoes in Indonesia and is easily confused with the very prominent volcano Merapi (central Java). The Marapi cone in the Dempo complex contains a ~ 400 m diameter crater lake, the source of both the 2006 and 2009 eruptions. The remainder of this report discusses the phreatic eruption that occurred in September 2006. This eruption had not been previously discussed in the Bulletin, and CVGHM reporting on the subject has recently come to our attention. In the month before this eruption, teams from the CVGHM had visited several times. On 13 August 2006, a team prepared a map of Dempo and reported that the condition of the water in Marapi's crater lake was normal and clear or slightly blue in color, with no bubbling. On 4 September 2006, a team climbed to the peak of Dempo and reported that activity was normal other than some bubbling at the E edge of the crater lake. 2006 phreatic eruption. On 25 September 2006, a phreatic eruption occurred that expelled water from Marapi's crater lake and propelled mud onto the area around the peak up to a radius of 300 m.
On the next day, the inspector for Dempo, Mr. Mulyadi, accompanied by six friends, inspected the volcano and its lake. According to Mulyadi's team, the lake water was bubbling and had changed to a grayish color. Acrid sulfurous emissions were accompanied by a hissing sound. The NW crater wall was covered by mud from the eruption. Many of the phreatic deposits around the crater lake were only about 0.5 cm thick, although in several other places they were thicker (figures 1-4). A visit on 4 October 2006 found the deposits not yet eroded, owing to a lack of rain since the eruption. Figure 1. Photo of the plume resulting from Dempo's phreatic eruption on 25 September 2006. This is one of a set of multiple photos taken of a rising plume. Photo by Fredy, a local resident. Courtesy of CVGHM. Figure 2. (top) Pre-eruption and (bottom) post-eruption scenes from the saddle between the cones of Dempo and Marapi looking upslope towards Marapi (which contains the source vent in a steep-sided crater not visible from this perspective). The shots were taken on 7 and 26 September 2009, respectively. Freshly deposited mud and evidence of ejected crater-lake water in the foreground (bottom) represents distal deposits from the 25 September eruption; note peson at right for scale. Large blocks were not from this eruption. Courtesy of the Dempo inspection team, CVGHM. Figure 3. Pre- and post-eruption photos looking into Marapi crater at Dempo, taken on 7 (top) and 26 (bottom) September 2006. The lake is on the order of 400 m across. The bottom photo portrays the crater's mud-covered walls and sediment-covered lake. Comparison of both photos indicates that after the eruption the lake surface had dropped, consistent with discharge of water and mud. Camera look-direction unstated. Courtesy of the Dempo inspection team, CVGHM. Figure 4. Post-eruption conditions on Dempo's Marapi cone seen from a point a few meters back from the crater rim. Widespread gray-to-brown mud covered the rim and upper crater, creating a desolate scene. The large angular blocks on the rim were placed there in previous events, not the 25 September 2009 eruption. Unstated direction; photographers shadow and gear for scale. Courtesy of the Dempo inspection team, CVGHM. Information Contacts: Center of Volcanology and Geological Hazard Mitigation (CVGHM), Jalan Diponegoro 57, Bandung 40122, Indonesia (URL: http://vsi.esdm.go.id/). 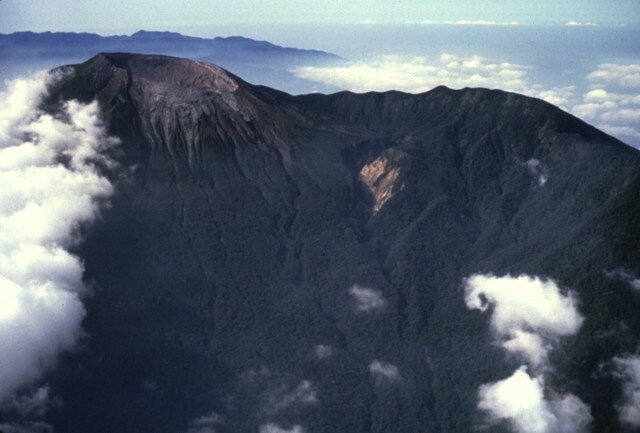 Dempo is a prominent stratovolcano that rises above the Pasumah Plain of SE Sumatra. The andesitic volcanic complex has two main peaks, Gunung Dempo and Gunung Marapi, constructed near the SE rim of a 3 x 5 km caldera breached to the north. The Dempo peak is slightly lower, and lies at the SE end of the summit complex. 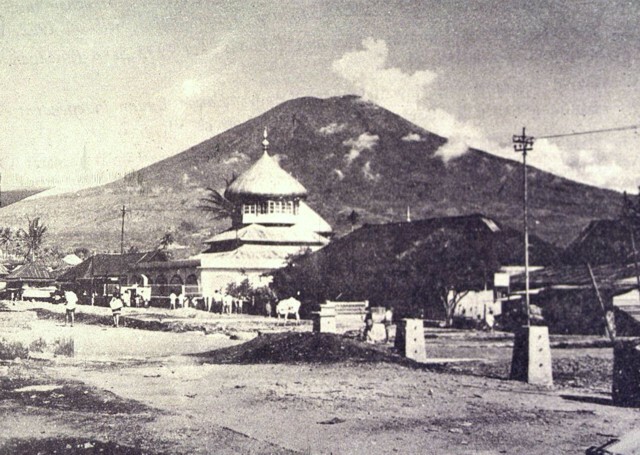 The taller Marapi cone was constructed within a crater cutting the older Gunung Dempo edifice. 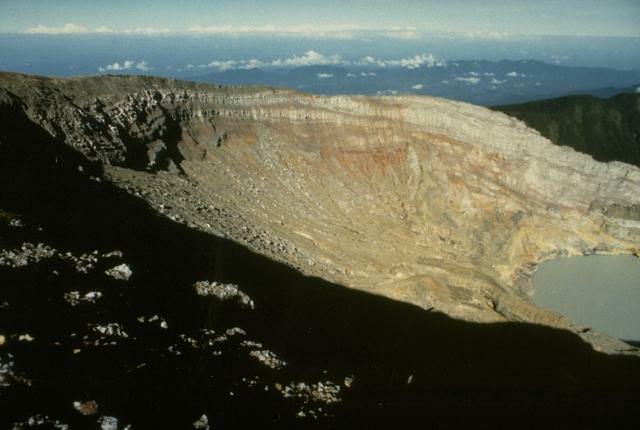 Remnants of seven craters are found at or near the summit, with volcanism migrating WNW over time. 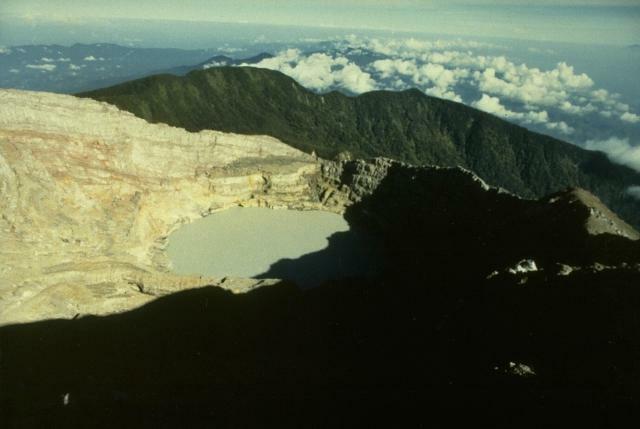 The large, 800 x 1100 m wide historically active crater cuts the NW side of the Marapi cone and contains a 400-m-wide lake located at the far NW end of the crater complex. Historical eruptions have been restricted to small-to-moderate explosive activity that produced ashfall near the volcano. There is data available for 28 Holocene eruptive periods. There is no Deformation History data available for Dempo. There is no Emissions History data available for Dempo. An atmospheric cloud rises above the summit of Dempo stratovolcano in SE Sumatra. Gunung Dempo here towers nearly 3 km above tea plantations below its eastern flank. Dempo is one of Sumatra's most active volcanoes, producing small-to-moderate explosive eruptions. Seven partially overlapping craters cut the summit; the youngest of these is partially filled by a crater lake. Photo by Deddy Rochendi, 1981 (Volcanological Survey of Indonesia). 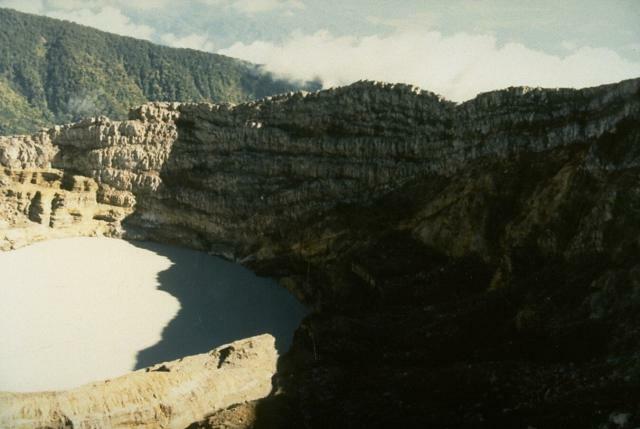 The youngest crater of Dempo volcano, at the WNW end of a series of six partially overlapping craters cutting the summit, contains a 400-m-wide crater lake that has been the source of frequent phreatic eruptions during historical time. A seventh smaller crater is located on the upper north flank. Dempo is one of Sumatra's most active volcanoes, frequently producing small-to-moderate explosive eruptions. Photo by Ruska Hadian, 1989 (Volcanological Survey of Indonesia). The crater wall of Kawah Merapi, the youngest and NW-most of the craters cutting the summit of Dempo volcano, is capped by thin lava flows; a crater lake is seen at the lower right in this view from the NE. Gunung Merapi, the high point of the summit region of Dempo volcano, occurs at the extreme left at the SE part of the crater rim. The crater wall above the historically active crater lake of Kawah Merapi at the summit of Dempo volcano shows a series of alternating lava flows and pyroclastic deposits. A scientist from the Volcanological Survey of Indonesia investigates rocks in the summit crater of Dempo volcano. The crater of Kawah Merapi on Dempo volcano truncates bedded pyroclastic material that is overlain by a series of light-colored lava flows. 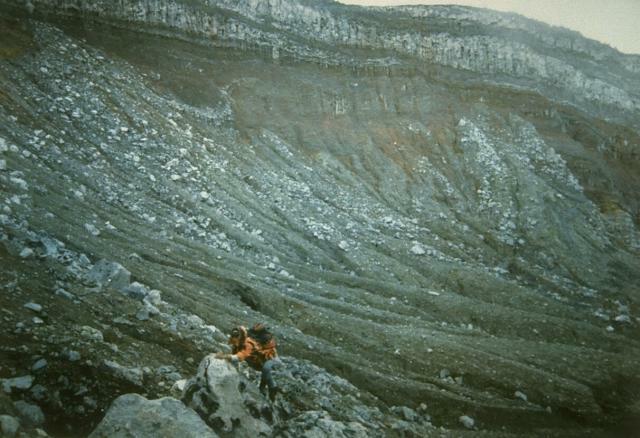 Photo by R. Whandyo, 1992 (Volcanological Survey of Indonesia). An aerial view from the north shows the summit crater of Dempo volcano at the upper left. The steep-walled crater contains a lake, out of sight in this view behind the NW crater rim. The crater lake has been the source of frequent phreatic eruptions during historical time. Gunung Dempo, one of the most active volcanoes of Sumatra, has a conical profile when viewed from the village of Pageralam below the eastern flank of the volcano. The summit contains nested craters on its NW side. 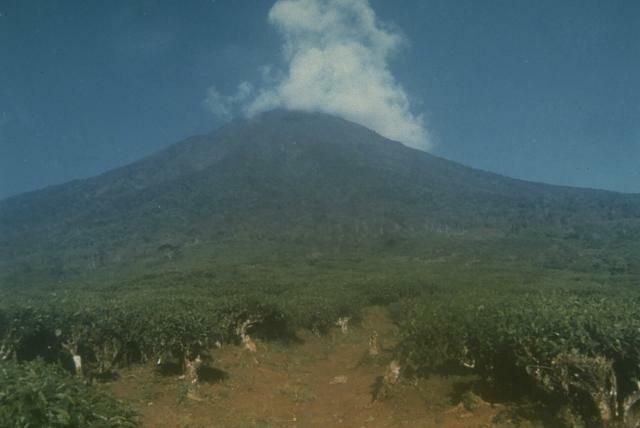 Photo by Sumarma Hamidi, 1972 (Volcanological Survey of Indonesia). There are no samples for Dempo in the Smithsonian's NMNH Department of Mineral Sciences Rock and Ore collection. Large Eruptions of Dempo Information about large Quaternary eruptions (VEI >= 4) is cataloged in the Large Magnitude Explosive Volcanic Eruptions (LaMEVE) database of the Volcano Global Risk Identification and Analysis Project (VOGRIPA).